The Invention of Wings: by Sue Monk Kidd | Conversation StartersA Brief Look Inside:The Invention of Wings, written by bestselling author Sue Monk Kidd is a novel of historical fiction, based loosely on the early life of Sarah Moore Grimké, an abolitionist and women’s suffrage pioneer. This dramatic story follows the lives of Sarah Grimké and Hetty “Handful” Grimké. Sarah is the daughter of a slaveholding family; Hetty is one of the family’s slaves. In this novel, Monk Kidd contrasts the different worlds these two characters inhabit, even though they are part of the same household. Sarah is the second child of her small family, and while her mother thinks of her as a difficult child, her father believes she is remarkable. On her eleventh birthday, Sarah is presented with a gift, a slave girl named Hetty Grimké. Hetty was plucked from the family’s slave quarters, separated from her mother, and is now expected to be Sarah’s personal slave and companion. Sarah knows her refusal to accept Hetty as a gift will bring about much trouble. On the other hand, Sarah personally abhors slavery and knows she cannot accept Hetty...EVERY GOOD BOOK CONTAINS A WORLD FAR DEEPERthan the surface of its pages. The characters and their world come alive,and the characters and its world still live on.Conversation Starters is peppered with questions designed tobring us beneath the surface of the pageand invite us into the world that lives on.These questions can be used to...Create Hours of Conversation:• Foster a deeper understanding of the book• Promote an atmosphere of discussion for groups• Assist in the study of the book, either individually or corporately• Explore unseen realms of the book as never seen beforeDisclaimer: This book you are about to enjoy is an independent resource to supplement the original book, enhancing your experience of The Invention of Wings. 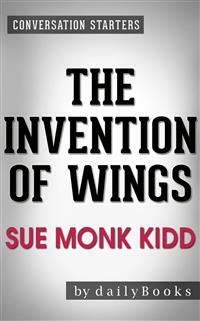 If you have not yet purchased a copy of the original book, please do before purchasing this unofficialThe Invention of Wings: A Novel by Sue Monk Kidd| Conversation Starters.